The first montage is of nature shots I took in my yard and neighborhood over the past six days. The brown thrasher was calling for a mate in my tree. The bottom right shot of flower petals on the ground almost look like snow to me. The second montage is of a walk at Fallon Park this Saturday which is in the neighborhood where I grew up. The field of buttercups reminded me of my childhood when we would make long necklaces in this park with the buttercups. From what was left on the picnic table I'm guessing some children picked more than they needed for necklaces. I rarely go to this park because there are so many parks near where I live now but whenever I visit someone or have an errand in that part of town I like to check out the old neighborhood park. 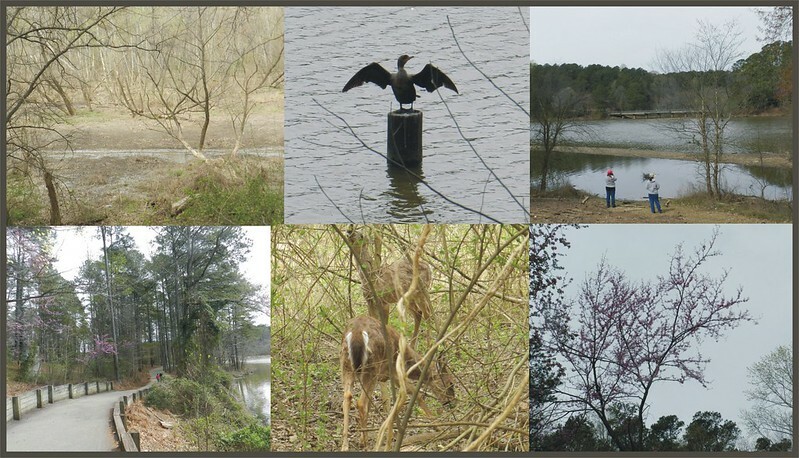 The last montage is from a walk at Shelley Lake, which is in the subdivision where I've lived for the past 30 years, that Bill and I went on today (Sunday). I would have missed the deer if a helpful man hadn't told me where they were. Sometimes people see my camera around my neck and will tell me about various things. Once someone told me where to look for a juvenile bald eagle and people often mention where the herons are. The cormorant in the shot above the deer stayed in that posture for a long time. The top left shot in the group below is of an area of wetlands and generally has a lot of water but it looks like it was dredged for some reason I can't guess. A lot of water birds nest near that area and I hope the dredging didn't upset them. Isn't spring delightful when you've had a long winter? Love your montages. I always like seeing your lake. Enjoying your thrasher. Isn't it great being looked after like this? I met a professional, though, and she wanted me to tell her where our Great horned owl was. I refused. There is enough traffic on the road as it is! There was another pro who sat there all day, blocking the road. The leftover necklace parts brought back lovely memories and touched my heart! I too love it when people point out photo ops. Recently learned that cormorants have to dry their feathers; they aren't coated to be waterproof (like ducks' feathers are, so that's why they sit so long with their wings spread out like that. Beautiful captures and perfect pictures of spring!! Wonderful! Thanks for sharing the beauty, Carver! Hope you have a great week!! 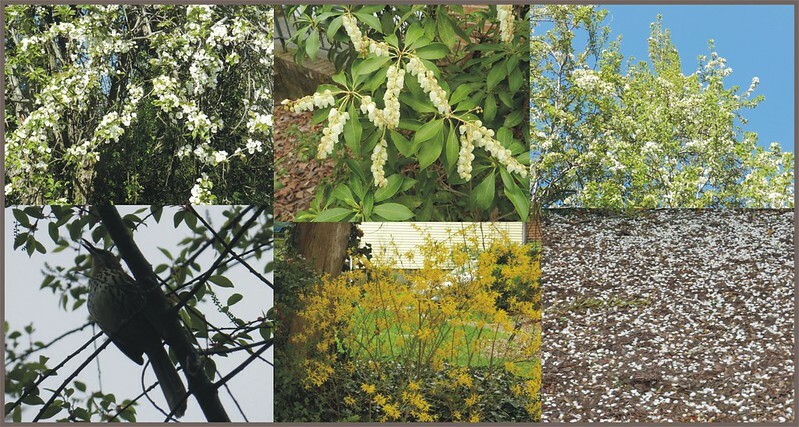 Three wonderful montages heralding the beginning of Spring. Lovely spring images, Carver. We are still not seeing any blossoms in my area yet.. I love your cute Thrasher and the pretty deer. I gravitated to the strewn buttercups and tree branches leaving shadows on the path floor. Parks near where you were raised and now where you live have surely enhanced the love of nature I see in your posts. april seems to be the time to go out and shoot something. there's always something blooming, growing, flying, crawling, etc. Very pleasing collages. You get such wonderful sights to frame. Three gorgeous areas! Oh, that forsythia! And the sweet deer. Gorgeous views! How gorgeous Carver! Beautiful spring collages. We are still waiting here. Wonderful neighbors. And such a nice place to live! Gorgeous photos, esp. The deer and that nice winding road by the lake. Greetings from egypt! Thanks Elizabeth. This isn't North Raleigh but the Raleigh Little Theatre rose gardens would be a good place. Also, the J.C. Raulston Arboretum would be a good place too. 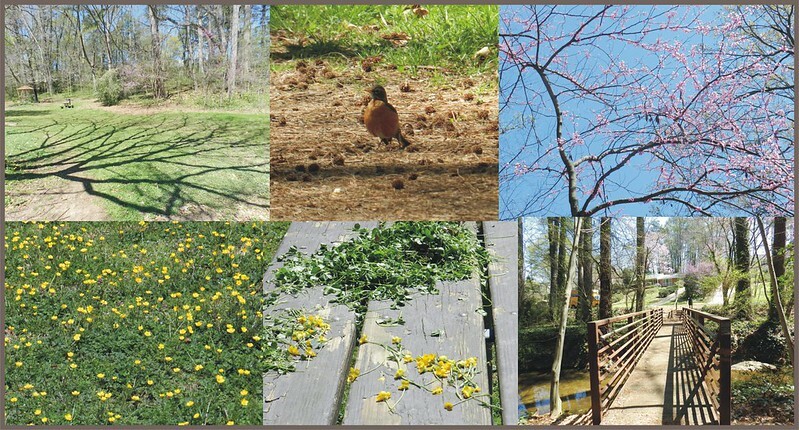 Here's a link to the arboretum site- http://www.ncsu.edu/jcraulstonarboretum/index.php That's near NCSU. The RLT Rose Garden is at 301 Pogue Street, Raleigh NC 27607 also near NCSU. As far as North Raleigh, Lake Lynn where you mentioned would be a nice place.